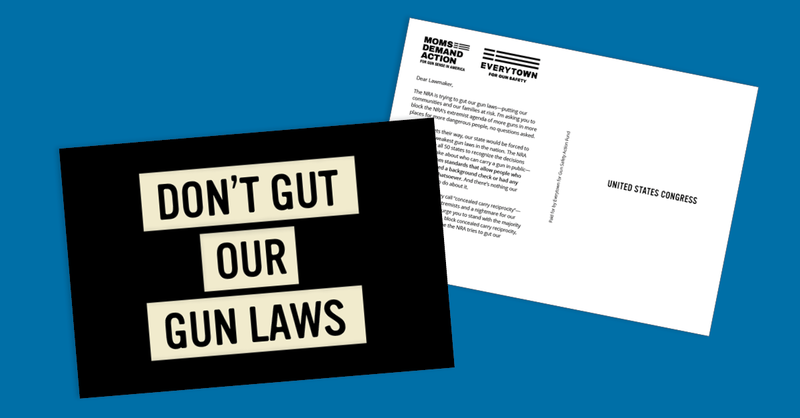 Use this form to send Congress a clear, resounding message: Don't gut our gun laws. Protect public safety. If the NRA gets their way, our state would be forced to abide by the weakest gun laws in the nation. The NRA wants to force all 50 states to recognize the decisions other states make about who can carry a gun in public -- even rock-bottom standards that allow people who have never passed a background check or had any safety training whatsoever.And there's nothing our state will be able to do about it.